SQL HAVING clause specifies a search condition for a group or an aggregate. HAVING is usually used in a GROUP BY clause, but even if you are not using GROUP BY clause, you can use HAVING to function like a WHERE clause. You must use HAVING with SQL SELECT. columns Name of the columns which will participate in grouping. How a HAVING clause works IN SQL? The select clause specifies the columns. The from clause supplies a set of potential rows for the result. The where clause gives a filter for these potential rows. The group by clause divide the rows in a table into smaller groups. The having clause gives a filter for these group rows. In the following example, the SQL WHERE clause along with the HAVING clause have used to make a select statement. 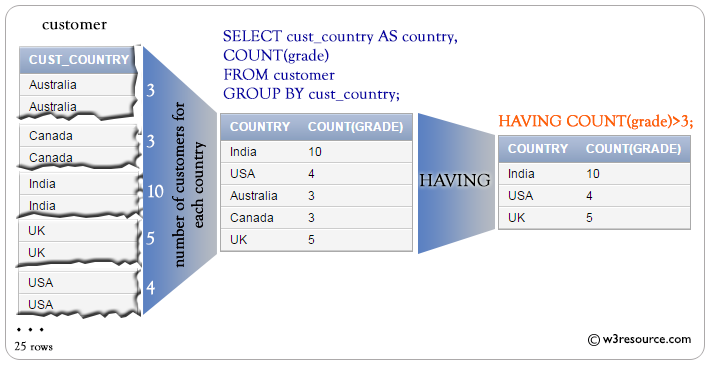 In the following example, the SQL WHERE clause along with the HAVING clause is used to make a query. An ORDER BY clause arranges the final result in the specific order. The default order is ascending.